The occupiers' tanks repeatedly pounded Luhanske, the Butivka mine, Kamyanka and Pisky. The Russian occupation troops have carried out 54 shooting attacks against the positions of the antiterrorist operation (ATO) troops since the midnight, the ATO HQ said on 5 March. Two servicemen were wounded, one injured, it said. "During the day, the occupiers' tank repeatedly pounded Luhanske, the Butivka mine, Kamyanka and Pisky. They fired with mortars of various calibres, grenade launchers and small arms on Avdiyivka, Mayorske, Novhorodske, Troyitske, Opytne, Pisky and Zaytseve. Infantry fighting vehicles fired on Luhanske," the statement reads. In the Mariupol sector, they fired with mortars on Talakivka, Hnutove, Vodyane and Shyrokyne, with heavy machine guns and small arms on Vodyane, Hnutove, Shyrokyne and Pavlopil, with infantry fighting vehicles and tanks on Vodyane and Shyrokyne. 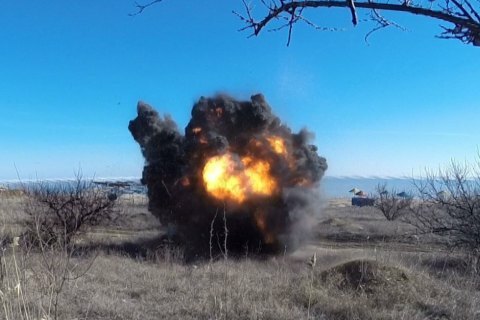 Anti-tank missile systems were used against Shyrokyne. According to the ATO HQ, the militants fired with 120-mm mortars on Novooleksandrivka and Bohuslavske and with small arms on Popasna. On 4 March, one Ukrainian serviceman was killed and 12 wounded.